Harvest Lane Cottage: Rejoice with Me! with a company in a nearby city! He begins work on Monday. to all you lovely people all over the world who have been praying for us. so we will continue to live on faith. before we see what we hope for. We had faith to tithe and faith to give. Our offering this Sunday was just one dollar. GOD HAS PROVEN HIMSELF FAITHFUL! The numbers simply don't make sense mathematically. Checks in the mail... finding money in an old purse... selling things... ten, fifty, and hundred dollar handshakes... $100 Walmart giftcard... $20 Walmart e-giftcard... boxes of toiletries, laundry supplies, and yarn being brought to us and mailed to us... a couple we once helped during a crisis many years ago brought us a card with two hundred dollars in it... firewood for the cold nights... meat... vegetables... fruit... bread... eggs... butter... baking supplies... lots and lots of potatoes... invitations to lunch and meals at church... a new dress for my daughter's spring banquet... books and items for review... $36 tucked into my purse... our savings... someone even gave us a car... and our insurance went down! Church family, my dad and Annie, dear friends, and my Harvest Lane Cottage readers have been so kind and generous to us. Your prayers for us have been answered. Lowell has found a good position. Thank you for praying and for giving to our need! "Now to him who is able to exceedingly abundantly above all that we ask or think, according to the power that works in us, to Him be glory in the church by Christ Jesus to all generations, forever and ever. Amen." ...praising God for faithful provision! So happy for you! Prayers answered!! He gave you everything you needed! Have a blessed day! I'm so happy for you! I've been checking here every day, hoping to hear good news about a job. Prayers answered! I hope your husband will be very happy with his new position! In His arms He carries them all day long." Oh, I DO thank God for answering the many prayers and coming to your rescue!! We shared in the burden, now we can share in the victory with you! SO very happy for you and your precious family. :) God has proven once again that He IS faithful! You are so very sweet. You worship is lavish to our Lord. Be blessed! You've prayed us through this. I know God will keep us going not just until we get the first paycheck but as we work through rebuilding our savings and recovering financially. 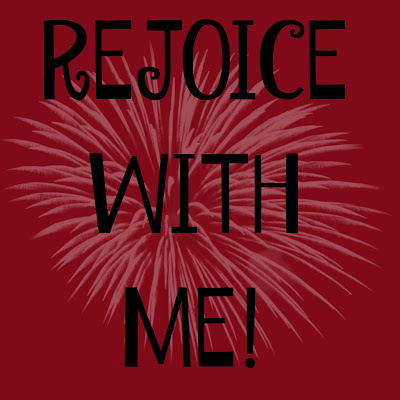 I am rejoicing with you! What beautiful news!!! Praise the Almighty! This is certainly good news! So happy for you all. Yay! I am so happy for answered prayers!! Congratulations! Praising God for you! Have a wonderful day. "I can do all things through Christ." Praising God with you! You were faithful thru this test and now look at the blessing of a job! Thank YOU Michelle for faithfully encouraging me and praying for our family. You are a dear! Wonderful news!!! God always has a reason for His timing. Praise God. I am so very happy for you and your family. Tell your husband Congratulations. Thanks so much, Judy! You were one of the prayer warriors who prayed us through. Thank you from my heart! It's going to be quite a transition— having him here all day to being gone from early morning until 6:30 or so at night. About two hours of driving a day, but we're so thankful he will be employed. A regular paycheck will make us feel rich! Hugs to you Judy! Thank God! Praise the Lord! YAAY!!!! Thank you Lord! Continuing to pray & trust Him with you as you wait for that first paycheck! What a wonderful testimony, not just for the new job, but for your faith and God's faithfulness throughout! I pray that you continue to see all the ways God has and will use this for your good and His glory! I'm visiting today from "Word of God Speak." Blessings! What a wonderful blessing! Such great faith and patience brings beautiful rewards! Thank you so much for your kind words. You've been one of the most encouraging people to me in the last few years. Be encouraged! Holy Spirit is with you! Laura, I followed you here from a comment you made on my page http://adonaistreasure.com. I have been praying for your family and will continue to. I am overjoyed your husband got a job! Now, God, in your time, provide an even better paying job he will love that is closer to home. We praise You now for providing, and for providing in all of the tomorrows. Agradecido! Todopoderoso! Thankful! Almighty God! Praise God, Laura!! Blessings and love. We, too, have been there! Praise God! Your blog is so inspiring. This is amazing news! Thanks, Linda. It's been a super busy week. So sorry I didn't write back. Hope your studies are going well! We've only recently met, Laura, but I'm so so happy for you all. It's all about God Gwen, when it comes right down to it. It Him we live and move and have our being! Thank you and God bless you and your family! Have a wonderful week Gretchen! Dear Laura ... loved how you shared all those examples of God's grace and faithfulness. Congrats to seeing His provision in full bloom! Thank you Linda! When that first paycheck comes, we're going to celebrate! Thank God for the Awesome Testimony. Oh I'm so happy for you. Prayers being answered is amazing isn't it! Yahoo! Such great news. God is good! Is there something about which I can pray for you? I am so happy for your husband and your family. I can't wait to hear how things are going. He has to make a long drive each day 1 or 1 1/2 hours each way depending on whether he hits traffic or not in the city. Tonight, we're finally going to get some time to talk. I think he likes the challenge of the work so far. Thank you everyone for your kindness, your prayers and your concern. Some of you are "no reply" bloggers. It's been a crazy week, so I haven't been able to track down everyone on their blogs. If you would like to know if you are a no reply blogger, this post explains how to tell. Oh so thankful with you Laura! This is a time that will go down in the history books of your family as a most amazing miraculous time of God's provision! How thankful I am that your hubby now has a job, but even more so... such incredible memories of a time where in spite of dire circumstances, the Lord never let you down! He is so faithful! Praising the Lord with you! What a wonderful way to look at it Spicing Up, may I always think of it in such a way. Thank you for praying and praising with me! Laura, what fabulous news! All of those prayers have been answered. Hope he loves it and everything works out wonderfully! Thanks for sharing with SYC. God is good! He knew what you needed and provided in different ways. This was a great post! Thank you for sharing your story with us over at the Welcome Home Wednesdays Link Party!